There have been many books and indeed many films concerning Enigma and Ultra. All are unsatisfactory to varying degrees. The present effusion suffers from a common defect. It is hard to engage us, in cinematic terms, by presenting decryption, or its value in the war effort: one is visually dull, the other incalculable. One is left to stage moral dilemmas or descend to caricatures of hobbits in Bletchley huts, sledgehammering us with reminders that queer little folk can do great things. Turing and his colleagues in Hut 8 were crucial to the effort to break the Enigma code machine in WWII but hardly unique – there were hundreds of other acts and ideas that contributed to cracking the codes and keeping that achievement secret, playing out from the early 1930s. Turing’s vaunted Banburismus procedure was abandoned and the bombe machines he invented (to compute the socket plugs and wheel combinations set on the enigma) were successfully upgraded by others. There was no eureka moment but a series of them. And the ethical predicament posed by ‘cracking’ enigma, leading to Ultra, was a multi-dimensional operation by MI6 that had little to do with Turing, who, of course, had to cope with certain secrets of his own. 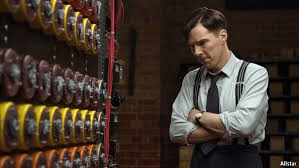 At least The Imitation Game is one of the better of the crop – contrast the notorious U-571, which features gallant Yanks rescuing an Enigma machine from a German sub (they didn’t) and tricking an enemy destroyer into sinking the sub (they didn’t). But ultimately it seques into a misleading mishmash of A Beautiful Mind, Little Britain, Dad’s Army and Rain Man. Although Benedict Cumberbatch is fine as Turing, Keira Knightley (here assuming a meld of Kate Winslet and Helena Bonham-Carter) archly leads a supporting cast of stiff upper lip types. Better to read Enigma:The Battle for the Code by Hugh Sebag-Montefiore or Codebreakers edited by Hinsley & Stripp (with a short chapter by Joan Murray, nee Clarke).